Ah, four-day weekend, piles of chocolate, plenty of time with my books. What could be better? Oh, and I threw in a bit more culture with a trip to the theatre just for good measure. After spending Good Friday being thoroughly lazy reading and watching films, yesterday my Dad and brother came to visit and get me out of the house! We went to see the Bristol Old Vic’s excellent Pinter/Beckett double bill A Kind of Alaska/Krapp’s Last Tape. I didn’t know anything about either play but I figured with writers like those you can’t go wrong. Glad to say it was a brilliant show. Both plays are meditations on ageing, in different ways. Both had touches of humour but were overall contemplative pieces. The small cast (three in the first play, one in the second) was fantastic and the Old Vic’s little Studio space was ideally suited. Today, friends told me there was a chocolate fair being held in the city centre so we headed down there and enjoyed a few free samples before pigging out on churros and hot chocolate. 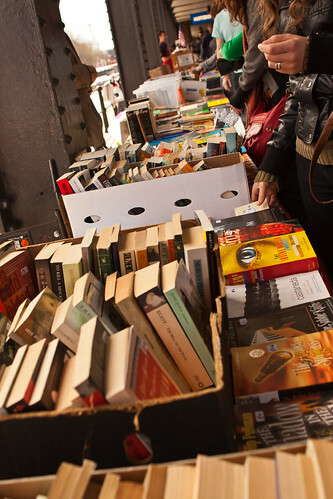 While we were in the area, we had a quick browse of the weekly books, arts and crafts market on the harbourside, where obviously I could not help myself buying a couple of books (really I am proud it was just two. I was sorely tempted to pick up handfuls of secondhand PG Wodehouse). My TBR will never get smaller, will it? And there’s still a day and a half stretching out before me with little to do other than read and sleep. Perfect. A day and a half of reading and sleeping sounds idyllic. Enjoy! Sunday Salon: A Slow-Book Manifesto. Hope you will stop by! Sounds like a wonderful time. Now I am craving chocolate. Today before I can relax with a book I must do our taxes 🙁 but chocolate will help that too!! Deb Thanks, and I will indeed stop by. First of all, welcome to The Sunday Salon. It’s one of the few meme-groups with which I’ve stayed from week to week for the last few years, because of the community and it gives me a chance to review my week. 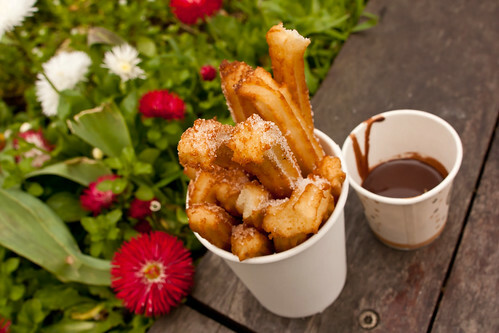 I’m not much of a chocolate fan, but those churros look yummy! What a great weekend! I love the picture of the churros. Happy reading. Vasilly Happy reading to you too! A day of reading and chocolate…what could be better! Welcome to the Sunday Salon…and enjoy. Love the whole look and feel of this post, especially the pictures. Churros, chocolate, books, sleeping…does life GET any better? Laurel-Rain Snow It is indeed pretty perfect. Lol – gotta love the CHOCOLATE!!! That’s me, alrighty!! Happy Easter!!! !